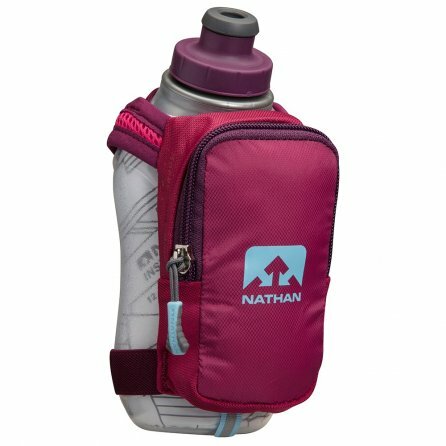 Hydration is just as important on short runs as it is during a marathon, so keep your water close at hand on every run with the Nathan Speed Shot Plus Running Water Bottle. It's got an adjustable strap to hold it in your hand so you can focus on your run, and the zip pouch gives you storage for whatever essentials you bring along on your run. But the real trick is the double-walled insulation that keeps the bottle 20% cooler than uninsulated alternatives, so when you take a sip from the Push-Pull Blast Valve™ you get refreshment even on the hottest days. Storage Volume: 8.5 cu. in.